A cipher (or cypher) comprises two or three intertwining script letters, as displayed on the right. This has been line engravedEngraving on a flat surface. The visual effect is created by reflected light. on a silver disc which is set into a kilt pin. In the next line we illustrate a number of variations to show how the design of a cipher can be varied dependent on size and shape of the item engraved. On the right are two ornate ciphers. The first, DG with acanthus leaf adornment, is typical of the 19th century. It is reproduced from Ian Grant's archivesThis appears in a handbook for engravers published in 1881; one of many passed down the generations and to Ian by his Master.. The second is typical of the 18th and early 19th century. It is reproduced from the impressionThis is also from Ian Grant's archivies. It was common practice then for an engraver to keep examples taken from impressions of earlier work. taken from a cipher engraved around 1820. The initials are EH. The H is in the centre with an E on the left and its mirror image on the right. The purpose would have been to create a symmetrical pattern when the letters did not naturally lend themselves to a pleasing design. A monogram is generally more elaborate and requires considerably more work, both in the design and the engraving. It is usually formed by combining two or more letters into a single motif. These are not in script. Traditionally, gothic lettering was used, sometimes heavily ornamented. When the monogram is designed so that the letters do not read conventionally from left to right the main letter is given prominence by its hatching or decoration. 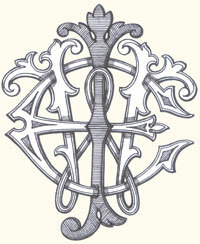 This is illustrated in the first monogram (CWJ) which is reproduced from a 19th centuryThis monogram was engraved in 1898 by the father of Ian's Master. Judging by its size (9.5 x 11.6cm - about 3.75 x 4.6") it would probably have been engraved on a silver salver. engraving. The second example illustrates the use of mirror images. In this instance the initials (DG) are mirrored, with the D's on the inside and the G's on the outside. Space permitting, some early monogram designs in this style incorporated three initials. Here are some more conventional monogram designs using the same initials and ornate Roman lettering. On the right is a monogram from 1864 and below are three from 1861. And finally, a monogram design from 1864 which illustrates the use of a single letter. It is a copper plate G decorated with acanthus leaves.